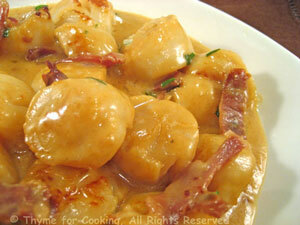 Seared Scallops, Maple Mustard Sauce, Thyme for Cooking healthy gourmet. Use the larger sea scallops for this if you can..... Scallops are best when cooked quickly as overcooking tends to make them tough. Use fairly high heat; they can give off a lot of liquid, and you want them to fry, not steam. Heat oil in a nonstick skillet over medium-high heat. Add Prosciutto and sauté until crisp. Add scallops and fry until lightly golden, then turn and fry the other side, 4 - 5 minutes total. Scallops are done when they turn opaque. Reduce heat to medium and add mustard, maple syrup, yogurt. Stir well to scrape up any browned bits. Heat through but do not boil. Add Parmesan, tarragon, Prosciutto and stir well. Spoon over scallops and serve.